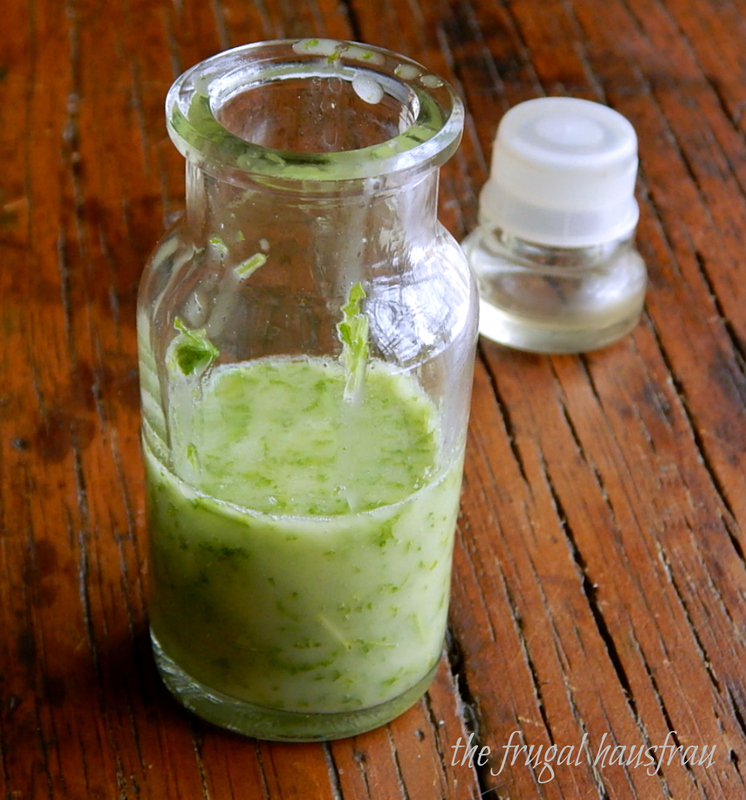 Simple little garnishing mixtures like this Cilantro Lime Oil are a great way to add a little flavor and brightness to all kinds of things. I drizzle it on my Red Lentil Soup with Coconut & Curry, but Cilantro Lime oil can go over all kinds of soups, be drizzled over croutons before baking or sauteing, used as a cooking oil or a dip for bread. The sky’s the limit. You might even want to dip tortilla chips or fries in it. And if you add a bit more olive oil and a little vinegar, you’ve got yourself a salad dressing. Maybe you’ll want to take this same concept and bend it to your taste. It’s a little like a bright citrusy Chermoula or a Chimichurri, and you can use whatever citrus you like and any herbs you want. Spice it up with a few red pepper flakes if that’s your thing. Save time and money on recipes like this by growing your own herbs. If you’re in a cold climate, bring them indoors in the fall, then replant in the spring. Even if you kill off a plant, a plant generally costs less than a packet or a bundle at the grocery store. In a blender, add a cilantro, garlic and the zest & juice of the lime. Pulse. Add two to three tablespoons of olive oil, enough to thin to desired consistency and whir until herbs are in small bits. Add salt & pepper if desired. Feel free to add a few red pepper flakes or spice this up in any way you wish. This makes a small amount of intensely flavored oil. Recipe may be increased. Follow my 12 Strategies – You’ll see them on the upper drop-down menu of every page and how I apply them, below. I’ll be posting this recipe at Fiesta Friday #206, co-hosted this week by Shinta @ Caramel Tinted Life and Diann @ Of Goats and Greens. This entry was posted in Click here for Fabulous Food Posts and tagged Condiments, Lime, Salad Dressings. Bookmark the permalink. I have to be careful with it. I’ll taste a piece of it before I buy it. It it’s not green and fresh, it makes a world of difference to me. But if anyone is a hater this is good with just about any fresh herb. This is such a great idea! This dressing would perk up anything it touches, I’d love some of that at hand at all times. That sounds like a fun idea. I came home from three weeks away to my plants just barely hanging on…well they weren’t in the greatest shape to start with…but spring will be here soon! Can’t wait for spring😁 we are freezing out here ! I know! But I’m late in answering and we’ve gotten into the high 30’s! You’d be doubling probably if you wanted to store any and I’ve only kept it for about a week and it was fine. It kept it’s flavor amazingly well. I have heard of, but not tried, storing herbs in the freezer in olive oil – made into little ice cubes. The oil’s supposed to preserve the compounds..
Not a bad way to use up any cilantro you have hanging around before it goes bad too…!